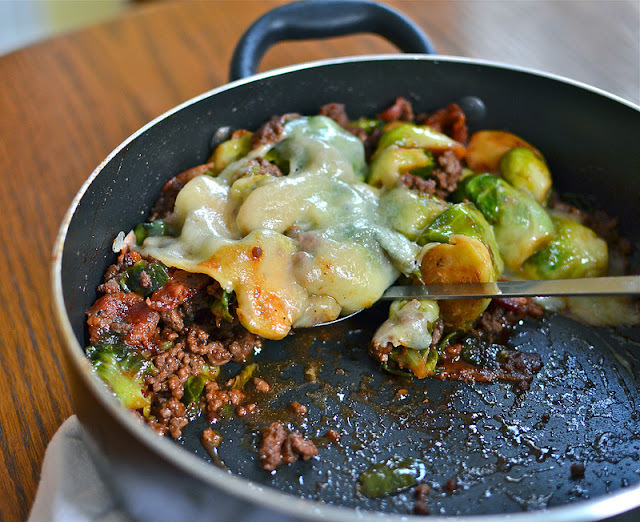 With the season of Brussels sprouts coming to an end, I thought I'd sneak one more recipe in on the blog with them; sorry, but I just couldn't resist. I actually made this two weeks ago, but wanted to share all my Easter stuff last week. In fact, I was editing my blog post the Saturday night before Easter before my mom, Steph, Nick, and I went to the Easter Vigil mass. 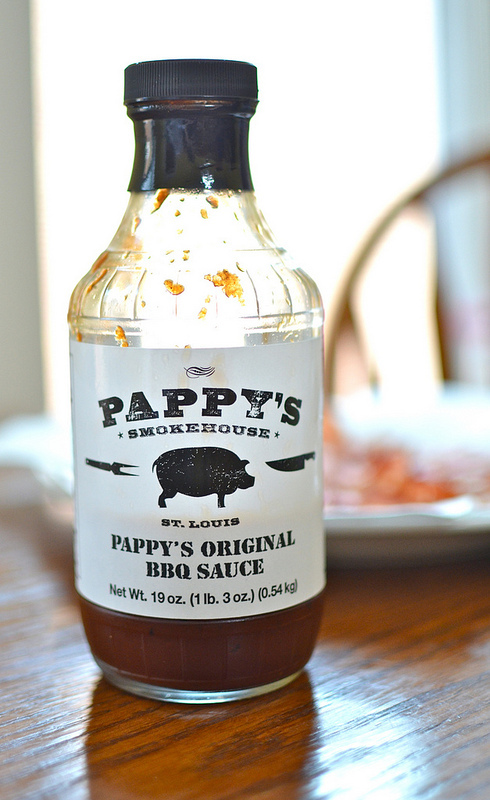 pappy's smokehouse bbq sauce. so good! My harshest critic (i.e. almost-eleven-year-old Mia who is also almost as tall as I am) caught me writing up the recipe and wanted to peek at the pictures. 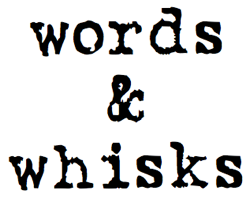 "You could use more than six strips of bacon in that," she quipped. Fortunately, in spite of its apparent bacon deficiency, she still approved of the recipe. Six slices of bacon is enough, though; I promise. On the subject of my harshest critic, she recently set my phone's profile so that an "Evil Queen Regina" now owns it. I'm leaving it like that, and I'm going to try to live up to the name now: you'd better watch out, Mia! As for everyone else... 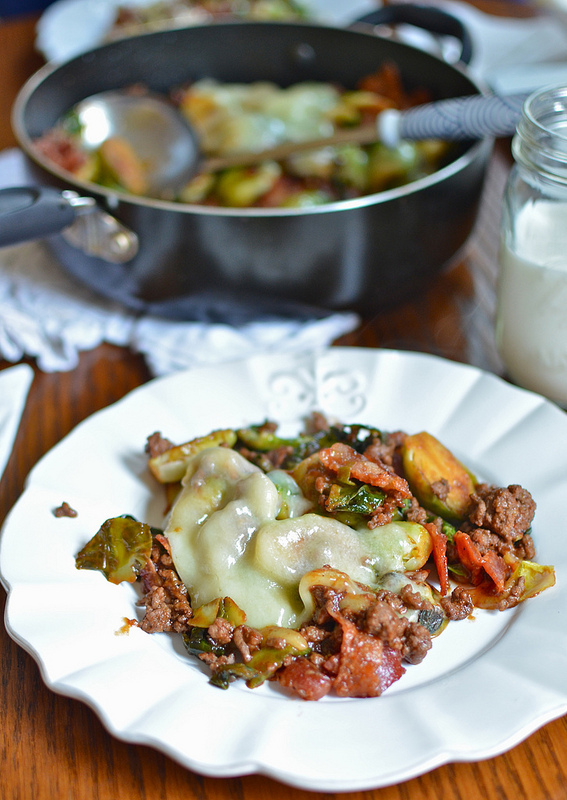 Happy Monday, and enjoy this easy, one-skillet, low-carb, and full-of-bacon skillet! And the last Brussels sprouts recipe of the season. I think. Bake the bacon: Line a rimmed baking sheet with aluminum foil. Layer bacon strips across the aluminum foil in a single layer. Place baking sheet in the oven and heat oven to 375 degrees F. Set a timer for about 17 minutes, and come back when it goes off to see if you bacon looks crispy. It normally takes my bacon anywhere from 17 to 20 minutes, depending on what type of bacon I buy. Remove from the oven when done and transfer to a plate lined with a paper towel. When cool enough, crumble for later use. 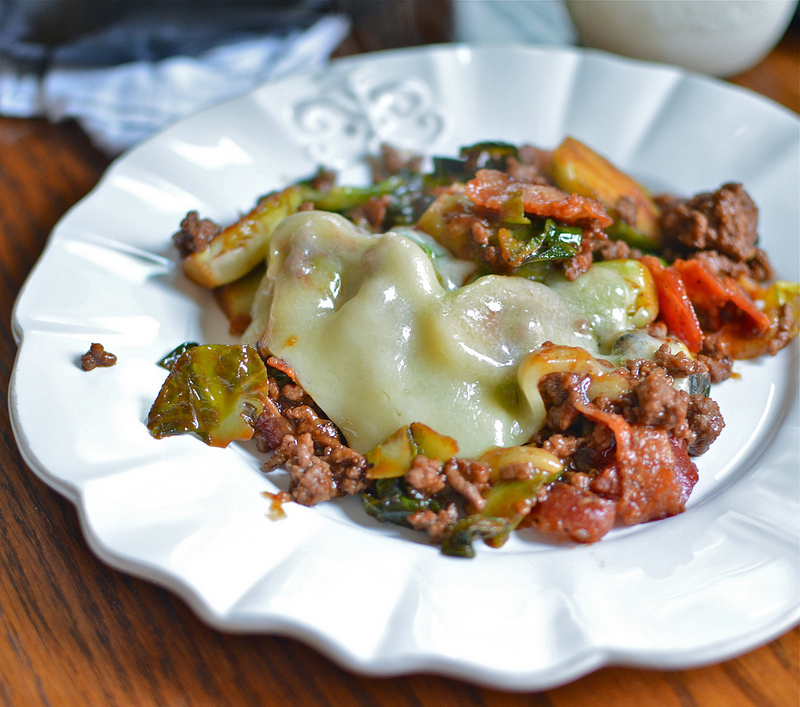 Cook the ground beef: In a large skillet, cook ground beef over medium heat, breaking up into medium-sized pieces. 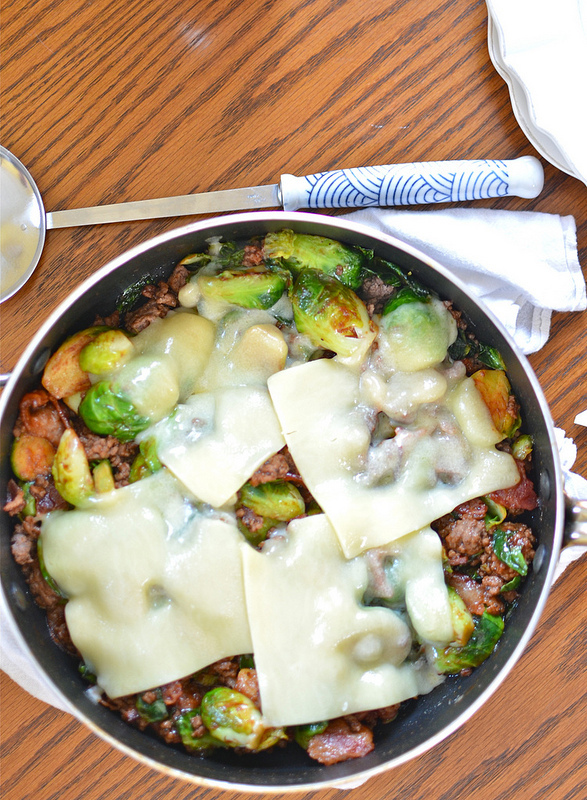 When the ground beef is cooked through, remove the skillet from the heat and transfer the ground beef to drain on a plate lined with a paper towel. Roast the Brussels sprouts: Wipe out the same skillet with a paper towel. Melt the butter in the skillet. Add the halved Brussels sprouts and season them with some salt & pepper. Cook the Brussels sprouts over medium to medium-high heat, stirring constantly until they have browned (about 6 to 8 minutes). 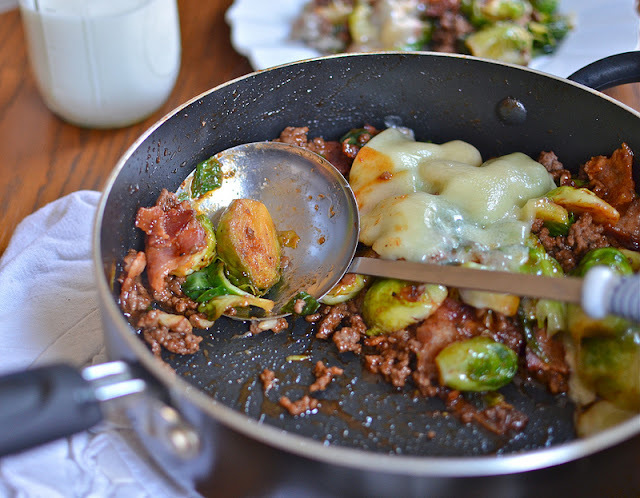 When the Brussels sprouts are about done, reduce the heat to low, and add in the crumbled bacon, beef, and a generous amount of BBQ sauce and stir together until combined. Continue to stir, heating everything for 1 to 2 minutes. 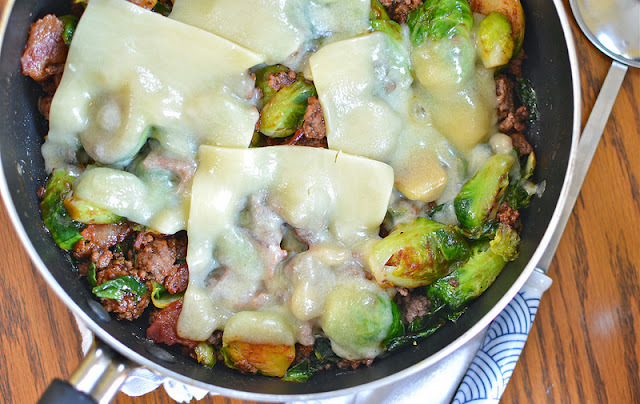 Layer the white cheddar slices across the mixture, cover the skillet with a lid, and continue to cook over low heat until the cheese has melted. When the cheese has melted sufficiently, serve. Perfect dessert? This chocolate pecan butter on some graham crackers!